Inter Milan have announced former Genoa boss Gian Piero Gasperini as their new coach on a two-year contract. A host of coaches had been linked with the post, including England manager Fabio Capello and new Chelsea boss Andre Villas-Boas. 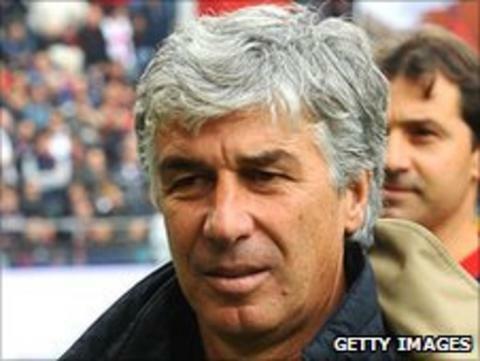 Gasperini, 53, was sacked by Genoa in November but earned plaudits when he led them to fifth in Serie A in 2009. Inter president Massimo Moratti said on the club's official website: "I am fully satisfied with the choice." Gasperini, who has also managed Crotone, will be Inter's fourth manager in a year following Jose Mourinho, Rafael Benitez and Leonardo, who is set to become sporting director at Paris St Germain. Inter were snubbed by Chile boss Marcelo Bielsa and Fiorentina's Sinisa Mihajlovic as they looked to replace the Brazillian, while they were put off a move for Villas-Boas by the 33-year-old's hefty £13.3m release clause - which the Blues met earlier this week.